Whip up chicken fingers, French fries, and other popular fried foods with the Avantco FF518 natural gas floor tube gas fryer! This floor fryer features five tubes and 150,000 BTUs of power to evenly heat oil and thoroughly cook any food. It has a spacious fry pot capable of holding up to 100 lb., and the thermostatic controls let you quickly and easily adjust temperatures from 200 to 400 degrees Fahrenheit. 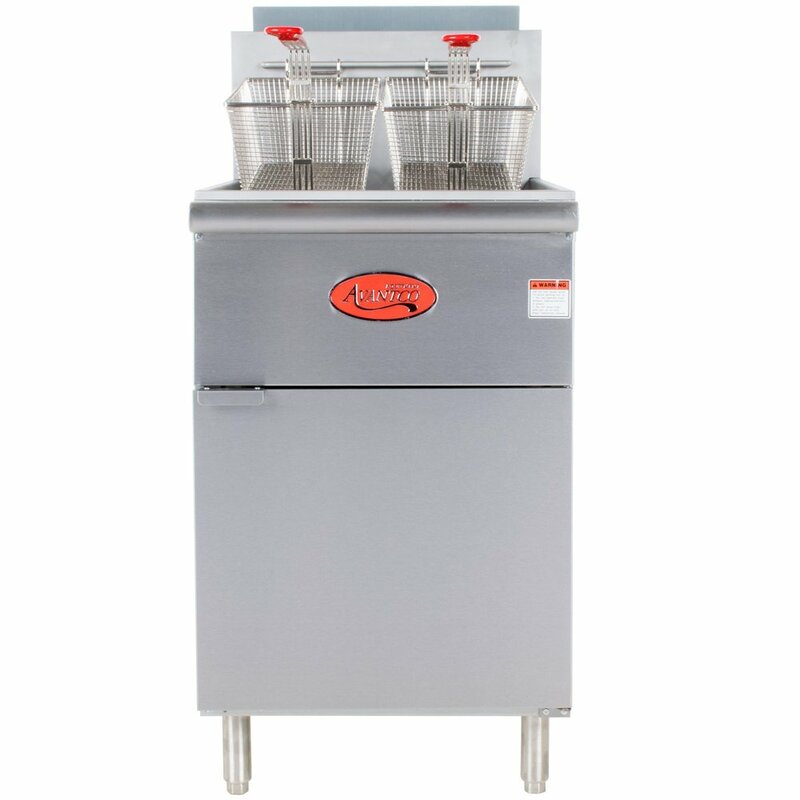 Two nickel plated chrome wire fryer baskets are included for convenience, each with a plastic coated handle to keep the operator's hands safe. The steel body provides outstanding durability, and its 6" adjustable legs let you place it at the perfect working height. For fast and easy cleaning, a full port drain is attached to the fry pot, and the exterior quickly wipes clean. This is not a review on the product, I'm trying to purchase two of these fryers I need to know the oil capacity of individual fryer. Great fryer! I bought one for my first store and when I opened up the second I knew exactly which fryer I was going to buy! A super high quality fryer that you should expect to pay much more for. Performs well, and has a very accurate thermostat. These should last for decades with the proper care, and compare to more recognized brands! Purchased 2 of these fryers. One for fries and the other for our fried chicken. Performance on these fryers are great. Heat up fairly quick and does a great job of frying the food. This fryer take about 105 gallons of oil to fill up to the max level. It take about 30-45 minutes to change the oil and clean the fryer properly with cleaning chemical. Love this Deep Fryer. Larger than a regular Deep Fryer. Works great for heavy traffic. Cooks a lot of French fries. Nice looking and easy to clean. Cant go wrong with this Deep Fryer. I bought 2 Deep Fryers from Avantco, Love them Both. Great buy for the money. They work perfectly and not too hard to clean. The only draw back is the control knobs, the numbers wear off pretty quick. This is a very average fryer. The price is excellent! Fryers are all stainless steel and metal. Has the same form factor as its competitors for half the price. So far so good after a year of use.. These fryers are great little workhorses. We fry a tremendous amount of chicken and fish in our buffet restaurant and these Avantco fryers never miss a bit. They may not last quite as long as the more expensive fryers, but their very low price point makes replacing them much less painful. Highly recommended. Great fryer. We have not had any issues out of this thing at all. Temp is perfect and regulated as well. Highly recommend this product. Works great. Doubles the volume of the deep fryer without doubling the space needed to put a deep fryer on the line at the restaurant. We purchased this fryer for our church. Our congregation has about 650-700 members and we have a lot of functions that require the preparation of food for large groups. This fryer serves that purpose well. I strongly recommend this deep fryer when you have to prepare food for large groups and small groups as well because you can use just one of the baskets. We are very happy with this fryer! It works great the heat keeps up and never slows down. i would by another one its a great product and the price is good. Nice size and very easy to use. Pilot stays on so just turn it up when you come in the morning. Nice size for volume frying. Good light duty fryer. It can get overwhelmed if doing a lot back to back. Fries and tenders take longer than a more heavy duty fryer. If you have multiple fryers I would recommend this one. If this will be your only fryer and you do high volume get a more heavy duty one. This fryer is great on the line and the temperature is very accurate to the dial setting. Most fryers lose their calibration. This one has lasted us 3 years. Great buy. This is a large floor style fryer! We love using it to create mouthwatering fried appetizers like fried pickles and mozz sticks!! Easy to clean and filter oil! !